Ring binders, folders and carry cases can all be adorned with many variations of fixtures and fittings, to give your chosen product the high end finish that will impress your customer. Ring binder fixtures and fittings can range from metal corners to straps with tuck in lock closures. Even simple velcro dots can be added to a strap to keep your binder or folder closed whilst not being used. 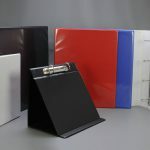 Carry handles are another fixture commonly used on ring binders, aiding the consumer to transport their folder easily. The ring mechanism inside your binder is also known through the trade as the “fitting” and is available in a vast array of capacities from 10mm being the smallest, to 80mm being the largest standard size available, the mechanism or fitting can also be supplied as a round, “D” or arch shape, as well as lever arch mechanisms, and if required can be coated to your chosen colour. Internal pockets, pen holders, CD wallets, USB holders are also fixtures and fittings that can be added to your binder or folder. Plastic security clips can be added that suit many of our mechanisms; these are fitted inside the front cover of your binder and “lock” onto the mechanism keeping the binder closed. Carry cases are another product Celsur can supply that have a multitude of fixtures and fittings available, handles affixed to the top of your case allow them to be carried as a briefcase. These handles are available as moulded plastic, leather handles and lay flat handles, tuck in lock closures keep your items secure. Internal divider sections can be fitted giving you multiple areas within the main body of your case, metal corners to the flap, hidden magnetic closures are becoming more prevalent, as they are out of sight and do not distract from the aesthetic look of the case but these are not advised if used in conjunction with carry handles.